For over 30 years, John Evans’ Sons has been the leader in spring reel elevator door technology. 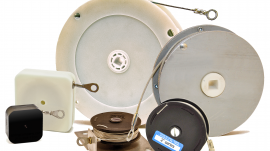 We supply spring reels to the world largest elevator system OEM’s and meet the most stringent quality control requirements for the industry. Spring powered reels or door closers (often called Spirators) can be quickly shipped to meet your delivery requirements.